If you have dogs and cats, have you ever noticed what happens when the doorbell rings? Generally, dogs think it’s the most exciting things that’s happened all day and can’t wait to greet the visitor. And, cats go hiding under a bed. While dogs require some consistency in their environment with a small amount of change brought in, cats need absolute consistency to thrive. Change in the cat’s physical environment—strangers, different food, additional animals, loud noises, illness, etc.—is a major contributor to stress. Research by Dr. C.A. Tony Buffington, at Ohio State University, showed that a primary cause of feline interstitial cystitis (a leading cause of euthanasia) is stress. Acute feline stress turns into chronic irritation, manifesting in disease and behavioral challenges. Feline sound therapy can provide consistency when Kitty’s world is filled with human changes. It reduces stress in a chaotic or unsettling environment. With best of intentions, people bring pets into a human sensory environment and expect quick adaptation. Sometimes animals adjust easily… and many times they can’t. Feline sound therapy can provide soothing auditory enrichment to help domesticated cats find balance in their ever changing physical world. A new, compact portable player called iCalmCat plays three hours of soothing soundtracks for Kitty on auto-repeat. The re-arranged classical piano compositions are shown to reduce stress in chaotic or unsettling environments. It provides the constancy needed for feline health and behavior. Take a listen and see how you and your kitty respond. In addition to Calming for Kitties, other add-on music programs for iCalmCat include Stimulation and Noise Phobias. Honestly, if you have a cat who freely roams outdoors, he won’t need Stimulation. The sonic caffeine of Stimulation is best for couch potato cats that are indoors and not able to use their natural hunting instincts. The fun tunes (including some flute soundtracks) are designed to adjust to a cat’s ability to hear three times higher than humans. Each sequence is timed for 10-minute play sessions with Kitty’s favorite 2-legged friend, hopefully that being you. 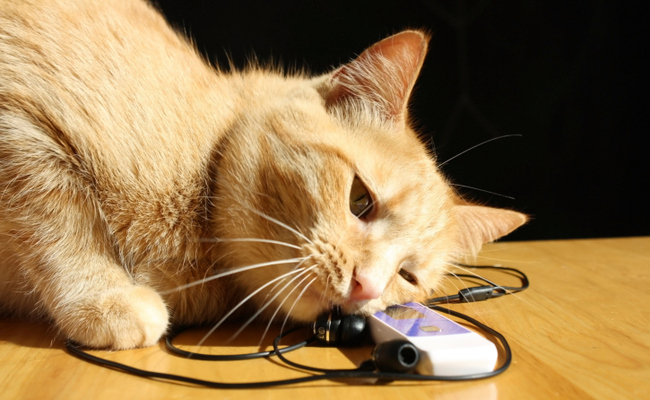 Noise Phobias provides a sonic inoculation for Kitty, designed to help cats who are fearful of common household and outdoor sounds. Noise Phobias also helps prevent noise phobia from ever developing. Does your Kitty flip out when anything new is brought into her environment? Is it a problem getting her to a a veterinary appointment because she won’t get into her crate? Thanks for sharing your experiences in a comment below. Can't wait to try it. Hope it gives her a new venue to enjoy. I ever thought of music to help my kitty . Thanks. Cats, like people, respond to calming music and sounds. This sounds like a great idea.